I feel like this might be cheating ever-so-slightly, but I also don't care. Technically, when I started this whole 'listen to 100 albums' thing about six years ago now, I wanted to listen to albums and sort of excluded Greatest Hits/Singles/Compilation albums, but for this one I made an exception. 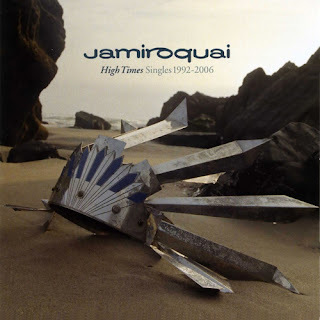 Jamiroquai is one of those bands that I sort of run into from time to time and I usually like what I hear. Of course, everyone remembers the trippy video for 'Virtual Insanity'- but I also had 'Cosmic Girl' in my rotation, but a few weekends back I learned that the Napoleon Dynamite dance sequence is actually another Jamiroquai song, 'Canned Heat'. So having learned that and, looking around for an album to listen too, I decided to take a deep dive into the music of Jamiroquai and listen to High Times, their Singles Collection which covers 1992-2006. First of all, I was somewhat surprised to learn that Jamiroquai is a band and not a person. They're fronted by their lead singer Jay Kay and Wikipedia describes them as a "British funk and acid jazz band." I have no earthly idea what acid jazz is (I've tried to dig on some Miles Davis and I just... I can't. I can't get into it. I'm not sure why. I feel like there is something slightly wrong with me) but if that's what Jamiroquai is, I'm down. At 19 tracks, High Times feels fairly comprehensive, but doing some digging it seems like it's more a Greatest Hits compilation instead of a Singles compilation- and sure enough, Wikipedia confirms that- pointing out that there are multiple singles that have been left out of this CD. The tracks I know are here and well represented, but it's the ones that I hadn't heard before that stand out. 'Deeper Underground' is a striking departure from the funk/jazz/soul/R&B feel of the entire album- it's darker and grittier... funky, but nasty. I dug it. 'Little L' and 'Love Foolosophy' are nice funky tracks that seemed to stick in my head a little more than the others. There really wasn't a dud on this album and to be honest, I'd happily throw this album on again and again. It's funky, it's smooth, it's right in my wheelhouse. Overall: funky, smooth and excellent, taking a deep dive into the music of Jamiroquai was a ride worth taking. I honestly loved every track on this album and I think I'm honestly going to save it as it's own playlist in my Spotify library. It's that good. I don't know what got me into funk/R&B or whatever you want to call it, but Jamiroquai has found a place in my rotation. Probably on a permanent basis.